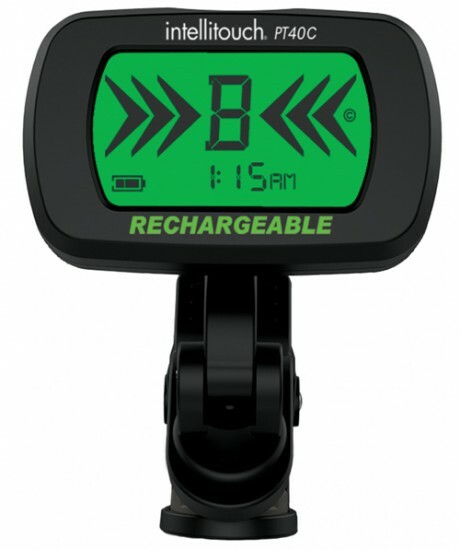 The New Intellitouch PT40c Rechargeable Tuner Combines vibration-based tuning with a Lithium Ion rechargeable battery! It is automatic, chromatic, and displays the measured pitch on a large, backlit display for easy tuning. While Intellitouch Tuners have always been known for their tuning precision, now an extra dimension has been added with a patented precision digital clock incorporated into the new PT40c Tuner. This feature allows a musician to discreetly check the time during a gig or lesson. The PT40c tuner ignores background noise - it feels the instrument's vibration instead of using sound. Works on electric and acoustic guitars, basses, violins, banjos, mandolins and more. A USB charging cable (included) enables fast charging. Unfortunately that product has been discontinued.